The historicity of Jesus concerns how much of what is written about Jesus of Nazareth is historically reliable. The historicity of Jesus covers a spectrum of ideas that range from the the gospels are inerrant descriptions of the life of Jesus to the gospels provide no historical information about Jesus' life including his very existence. The majority of scholars who study early Christianity believe that the Gospels do contain some reliable information about Jesus, agreeing that Jesus was a Jew who was regarded as a teacher and healer, that he was baptized by John the Baptist, and was crucified in Jerusalem on the orders of the Roman Prefect of Judaea, Pontius Pilate, on the charge of sedition against the Roman Empire. According to traditional Christian Church teaching the Gospels of John and Matthew were written by eyewitnesses, but a majority of modern critical biblical scholars no longer believe this is the case. Material which appears to refer to Jesus includes the books of the New Testament, statements from the early Church Fathers, hypothetical sources which biblical scholars argue lie behind the New Testament, brief references in histories produced decades or centuries later by pagan and Jewish sources such as Josephus, gnostic and other apocryphal documents, and early Christian creeds. Not everything contained in the gospels is considered to be historically reliable, and elements whose historical authenticity is disputed include the two accounts of the nativity of Jesus, as well as the resurrection and certain details about the crucifixion. Last Edit: 30 Окт 2014 02:15 by Vladimirovich. The Jesus myth theory (also known as the Christ myth theory and the nonexistence hypothesis) is the idea that Jesus of Nazareth was not an historical person, but is a fictional or mythological character created by the early Christian community. Some proponents argue that events or sayings associated with the figure of Jesus in the New Testament may have been drawn from one or more individuals who actually existed, but that none of them were in any sense the founder of Christianity. The history of the idea can be traced to the French Enlightenment thinkers Constantin-Franois Volney and Charles Franois Dupuis in the 1790s. Notable proponents include Bruno Bauer in the 19th century, Arthur Drews in the 20th century, and more recently G.A. Wells, Alvar Ellegrd, and Robert M. Price. The idea has come to public attention through the work of writers such as Richard Dawkins, Christopher Hitchens, and the French philosopher Michel Onfray. Last Edit: 30 Окт 2014 02:16 by Vladimirovich. The term historical Jesus refers to scholarly reconstructions of the 1st-century figure Jesus of Nazareth. These reconstructions are based upon historical methods including critical analysis of gospel texts as the primary source for his biography, along with consideration of the historical and cultural context in which he lived. Historical Jesus scholars typically contend that he was a Galilean Jew living in a time of messianic and apocalyptic expectations. Jesus was baptized by John the Baptist, whose example he may have followed, and after John was executed, began his own preaching in Galilee for only about two to three years prior to his death. He preached the salvation, everlasting life (John 17:3), cleansing from sins, and the Kingdom of God, using parables with startling imagery, and was said to be a teacher and a faith healer. Some scholars credit the apocalyptic declarations of the Gospels to him, while others portray his Kingdom of God as a moral one, and not apocalyptic in nature. He sent his apostles out to heal and to preach the Kingdom of God. Later, he traveled to Jerusalem in Judea, where he caused a disturbance at the Temple. It was the time of Passover, when political and religious tensions were high in Jerusalem. The Gospels say that the temple guards (believed to be Sadducees) arrested him and turned him over to Pontius Pilate for execution. The movement he had started survived his death and was carried on by his brother James the Just and the apostles who proclaimed the resurrection of Jesus. It developed into Early Christianity (see also List of events in early Christianity). The historical reliability of the Gospels refers to the reliability and historic character of the four New Testament gospels as historical documents. These gospels, the Gospel of Matthew, the Gospel of Mark, the Gospel of Luke and the Gospel of John recount the life, ministry, crucifixion and resurrection of Jesus. Historians often study the historical reliability of the Acts of the Apostles when studying the reliability of the gospels, as it was written by the same author as the Gospel of Luke and many believe that it was originally written along with the gospel as part of a two-volume series, called Luke-Acts. Historians subject the gospels to critical analysis, attempting to differentiate authentic, reliable information from possible inventions, exaggerations, and alterations. According to the majority viewpoint, the Synoptic Gospels are the primary sources of historical information about Jesus. and of the religious movement he founded, but not everything contained in the gospels is considered to be historically reliable. Elements whose historical authenticity is disputed include the two accounts of the nativity of Jesus, as well as the resurrection and certain details about the crucifixion. On one extreme, some Christian scholars maintain that the gospels are inerrant descriptions of the life of Jesus. On the other extreme, some scholars have concluded that the gospels provide no historical information about Jesus' life. The Gospel of Mark, believed to be the first written of the four gospels, narrates the baptism of Jesus, his preaching, and the crucifixion of Jesus. Matthew and Luke follow Mark's narrative, with some changes, and add substantial amounts of Jesus' ethical teaching, such as The Golden Rule and the Sermon on the Mount and Sermon on the Plain. 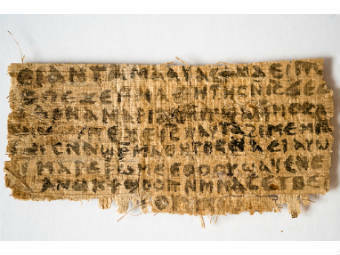 The fourth gospel, the Gospel of John, differs greatly from the first three gospels. Acts of the Apostles narrates the events of the Apostolic Age, from the resurrection of Jesus around 33 AD to the arrival of Paul the Apostle in Rome around 62 AD. The canonical gospels, overall, are considered to have more historically authentic content than the various non-canonical gospels. The synoptic gospels (Mark, Matthew, and Luke) are considered more historically reliable than John. Since the gospel manuscripts include many variants, scholars use textual criticism to determine which variants were original. They also determine which details can be trusted within the context of the 1st century Greco-Roman world and which cannot. To answer this question, scholars have to ask who wrote, the gospels when did they write them, what sources did they use, how reliable were these sources, and how far removed in time were these sources from the events they describe. Scholars can also look into the internal evidence of the documents, to see if, for example, the document is making claims about geography that were correct, of it the author appears to be hiding embarrassing information. Finally, scholars turn to external sources, including the testimony of early church leaders and historians, writers outside the church (mainly Jewish and Greco-Roman historians) who would have been more likely to have criticized the church, and to archeological evidence. Jesus was born either before 4 BC (when Herod the Great died) or in 6 AD (when the historical Census of Quirinius was undertaken). The traditional date, 25 December 1 BC (not 1 AD, see below), is a combination between a symbolic choice (for the day of the year) and a calculation of Dionysius Exiguus (for the year itself). According to the Gospel accounts, Jesus was raised from the dead on the first day of the week following his crucifixion. Last Edit: 30 Окт 2014 02:17 by Vladimirovich. Most scholars who study the Historical Jesus and Early Christianity believe that the Canonical Gospels and life of Jesus must be viewed as firmly placed within his historical and cultural context, rather than purely in terms of Christian orthodoxy. They look at the forces which were in play regarding the Jewish culture at that time, and the tensions, trends, and changes in the region under the influence of Hellenism and the Roman occupation. Thus, the cultural and historical context of Jesus is that of 1st century Galilee and Judea, which is modern day Israel, Palestine, and Jordan. By 63 BC/BCE, the partially-Hellenized territory had come under Roman imperial rule as a valued crossroads to trading territories and buffer state against the Parthian Empire. The Roman prefect's first duty to Rome was to maintain order through his political appointee the High Priest. In general, Roman Judea was peaceful and self-managed, although riots, sporadic rebellions, and violent resistance were an ongoing risk. The conflict between the Jews’ demand for religious independence and Rome's efforts to impose a common system of governance meant there was underlying tension. Four decades after Jesus’ death the tensions culminated with the first Jewish-Roman War and the destruction of the Temple in Jerusalem. This, in turn, was a catalyst for the final stage in the birth and divergence of Early Christianity and Rabbinic Judaism. The quest for the historical Jesus is the attempt to use historical rather than religious methods to construct a verifiable biography of Jesus. As originally defined by Albert Schweitzer, the quest began in the 18th century with Hermann Samuel Reimarus, up to William Wrede in the 19th century. The quest is commonly divided into stages, and it continues today among scholars such as the fellows of the Jesus Seminar. Reimarus composed a treatise rejecting miracles and accusing Bible authors of fraud, but he didn't publish his findings. Gotthold Lessing published Reimarus's conclusions in the Wolfenbuettel fragments. D.F. Strauss's biography of Jesus set Gospel criticism on its modern course. Strauss explained gospel miracles as natural events misunderstood and misrepresented. Ernest Renan was the first of many to portray Jesus simply as a human person. Albrecht Ritschl had reservations about this project, but it became central to liberal Protestantism in Germany and to the Social Gospel movement in America. The Historical reliability of the Acts of the Apostles, the primary source for the Apostolic Age, is a major issue for biblical scholars and historians of Early Christianity. Three early histories that mention Jesus and the birth of Christianity are the Antiquities of the Jews by the Jewish historian Josephus (which only briefly mentions Jesus), the Church History of Eusebius of the 4th century, and Luke–Acts, a two part history by Luke who was believed to be a follower of Paul. Last Edit: 30 Окт 2014 02:18 by Vladimirovich. Израильские учёные подтвердили подлинность 2000-летнего каменного гроба, на котором нанесено имя одного из родственников первосвященника Каиафы, упомянутого в Новом Завете. Напомним: этот персонаж сыграл ключевую роль в решении о распятии Иисуса. По-видимому, он существовал в действительности, считает Израильский департамент древностей. Гроб украшен стилизованными цветами и несёт надпись: «Мириам дочь Иешуа сына Каиафы священника Маазии из Бет-Имри». Склеп обнаружили «чёрные археологи» три года назад. Поскольку находка была сделана не в обычном порядке (а раскопки должны контролироваться), ныне она проходит лабораторные тесты, на что, конечно, повлияла и особая важность объекта. Сотрудники университетов Тель-Авива и Бар-Илана с помощью мощных микроскопов изучили слои, которые за все эти годы должны были нарасти на стенках гроба и самой надписи, и пришли к выводу, что это действительно древняя вещь. Учёные полагают, что оссуарий Мириам был извлечён из могилы в долине Элах к юго-западу от Иерусалима. Слово «Маазия» означает подгруппу священнической касты. «Бет-Имри» — это название либо рода, либо деревни, из которой происходила семья Каиафы. А я думал, что евреи хоронят без гроба. Помнится, этот обычай возник позже, где-то во 2-м 3-м веке - как следствие обезлесиванья. Или необходимости хоронить сразу многих(во время восстаний). Можно спросить Игоря на чесспро. А что привело к обезлесиванью? А может Ной порубил весь лес для постройки ковчега? Книга есть Критика древнего христианства. Полагаю истории невыдуманные там. 2. это м.б. так, но значения не имеет. 3. Ничего тут нового нет. В Ватикане найдена древняя рукопись, проливающая свет на обстоятельства рождения Христа. Документ представляет собой написанную от первого историю о том, как волхвы принесли дары младенцу Иисуса. Американский ученый, дешифровавший текст, не исключают, что его автор своими глазами видел Христа, пишет Times. Уникальный исторический документ более 250 лет пролежал в архивах Ватикана. Больше о его происхождении ничего не известно. Текст озаглавлен как «Откровение волхвов» и написан на мертвом сирийском языке, который является диалектом арамейского. На нем говорили ранние христиане, проживавшие на территории нынешней Сирии, Ирака и Ирана. Рукопись расшифровал и перевел на английский профессор религиоведения университета Оклахомы Брент Ландо. По словам ученого, находка представляет собой копию документа, написанного в третьем веке. Ландо пишет, что она была сделана в восьмом веке, менее чем через сто лет после появления Евангелия от Матфея, где впервые было описано путешествие волхвов к месту рождения младенца Иисуса. В изложении автора «Откровения волхвов» эта история значительно отличается как от текста святого Матфея, так и от других версий данного библейского сказания. Согласно древнему документу, волхвов, принесших дары младенцу Иисусу, было не трое, как во многих вариантах легенды, а десятки. В Евангелии от Матфея, впрочем, количество волхвов вообще не упоминается. Кроме того, в тексте говорится, что мудрецы пришли к Марии и Иосифу не из Персии, а из страны Штар, которую переводчик отождествляет с древним Китаем. В документе сказано, что все волхвы являлись потомками Сифа, третьего сына Адама. Они были мистиками, создавшими секту, участники которой «молились молча». Автор рукописи подробно рассказывает об их обрядах и ритуалах. Также автор «Откровения волхвов» пишет, что Вифлеемская звезда, которая привела мудрецов в пещеру, где появился на свет Иисус, превратилась в «маленького лучезарного человека». По словам американского ученого, в тексте сказано, что «Вифлеемская звезда и Христос — это одно и то же» и «богочеловек способен принимать любые обличия». Last Edit: 30 Окт 2014 02:19 by Vladimirovich. А очевидцы в Северной Корее записали в папирюсы, что небо на похоронах Вождя плакало, белая птица смахивала крылом снег с гроба, в котором никого нет. С Рождеством кого-нибудь, Владимирович! Американские и немецкие геологи утверждают, что они определили точную дату смерти Иисуса Христа на основе анализа сейсмической активности в районе Мертвого моря, сообщило в пятницу агентство KAI. Джефферсон Уильямс (Jefferson Williams) из организации Supersonic Geophysical вместе с коллегами из Немецкого центра геологических исследований Маркусом Швабом (Markus Schwab) и Ахимом Брауэром (Achim Brauer) заявили, что распятие и смерть Христа на кресте произошли в пятницу, 3 апреля 33 года нашей эры. Ученые сопоставили сейсмические данные с текстом Нового Завета и астрономическими наблюдениями. Хронология землетрясения в районе Мертвого моря показала, что район, расположенный примерно в 20 километрах от Иерусалима, была особенно сейсмически активен в 31 г. до н.э., а также между 26 и 36 годами нашей эры. Второе землетрясение произошло в те дни, когда он был прокуратором Иудеи Понтий Пилат. Смерть Иисуса в это время подтверждают четыре Евангелия и тексты римского историка Тацита. Уильямс объясняет описанную в Евангелиях темноту, которая наступила после смерти Христа песчаной бурей, которые нередки в этой местности. По словам священника, нынешние границы города - это границы времен крестоносцев, их стена. Он напомнил, что Иерусалим неоднократно уничтожался практически до основания, в том числе римскими солдатами в 70 г., при императоре Андриане в 135 г., персами в 614 г. Однако, продолжил Александр Тимофеев, Голгофу, скалу, где был распят Спаситель, по каким-то причинам не стесали, сохранили. Подлинным является и крест Господень: его нашли в цистерне: в таких емкостях в древних городах запасали дождевую воду. Папа Римский Бенедикт XVI во время отпуска завершает работу над третьим, заключительным томом книги Иисус из Назарета и апостольским обращением, посвященным проблемам Ближнего Востока, сообщило в пятницу радио Ватикана со ссылкой на пресс-секретаря Святого престола. Первый том книги Иисус из Назарета был опубликован в 2007 году. На русском языке он вышел в 2008 году. В 2011 году второй том на английском языке попал в десятку самых продаваемых книг в США. Всего было напечатано 1,2 миллиона экземпляров второго тома Иисуса из Назарета на немецком, итальянском, английском, испанском, французском, португальском и польском языках. В книге Папа размышляет о важнейших событиях в жизни Христа, описанных в Евангелиях: о триумфальном входе в Иерусалим, изгнании торговцев из Храма, тайной вечере с учениками, молитве в Гефсиманском саду, крестному пути, распятию, погребению и воскресению. Заключительный том книги Иисус из Назарета Бенедикт XVI посвятил богословской рефлексии над детством Христа. Когда понтифик планирует завершить свой труд, не сообщается. Ватикан назвал папирус с упоминанием жены Иисуса подделкой, пишет The New York Times со ссылкой на официальную газету Святого престола L’Osservatore Romano. Колонка о папирусе, написанная главным редактором издания Джованни Мариа Вианом, была опубликована номере газеты от 28 сентября. О существовании папируса, в котором Иисус говорит о жене, на научной конференции в Риме рассказала профессор Гарвардской школы богословия Карен Кинг. По ее словам, на фрагменте папируса написано по-коптски: Иисус сказал им: моя жена. Кинг считает этот папирус фрагментом неизвестного евангелия, которое, предположительно, было написано в II веке на греческом и позднее переведено на коптский. Last Edit: 30 Окт 2014 02:20 by Vladimirovich. На этой неделе в продажу вышла книга Папы римского Бенедикта XVI Иисус из Назарета: рассказы о детстве. В ней утверждается, что Иисус Христос родился на несколько лет раньше относительно даты, считающейся отправной точкой христианского летоисчисления. Исчисление точки отсчета в нашем календаре, основанном на рождении Иисуса, осуществлялось аббатом Дионисием Малым, который ошибся в своих вычислениях на несколько лет, - утверждается в книге. - Фактическая дата рождения Христа была на несколько лет раньше, чем принято считать. В городке Монца, который находится недалеко от Милана, есть кафедральный собор св. Иоанна Крестителя (Сан-Джиованни Баттиста). Над главным алтарём этого собора на цепях висит предмет, который все называют “Железной короной Ломбардии” (“Corona Ferrea”). На самом деле, это лишь очень точная копия короны, а оригинал находится в специально оборудованном сейфе, и никто точно не знает, где находится этот сейф. Железная корона Ломбардии представляет собой диадему, изготовленную из золота, украшенную различными драгоценными камнями и местами покрыта зелёной эмалью. Корона состоит из шести сегментов, соединённых между собой золотыми же вертикальными шарнирами. Каждый сегмент украшен несколькими драгоценными камнями и имеет приблизительные размеры 5.5 х 8.0 см. Почти все современные изображения “железной короны Ломбардии” сделаны с копии, висящей в соборе с Монце, так как хранители этой реликвии предпочитают лишний раз её не показывать оригинал широкой публике. Почему эта корона называется “железной”? Все сегменты этой короны изнутри соединены тонкой (около 1 см высотой и 1 мм толщиной) железной полосой – вот корона и называется железной. А железо это не простое – эта полоска раскатана из гвоздя, одного из тех железных гвоздей, которыми римляне прибили тело Иисуса Христа к кресту. Правда, гвозди, которые римляне использовали для подобных целей, были весьма большими, так что полоска из одного такого гвоздя могла бы быть и посолиднее. Гвозди, которыми тело Спасителя было прибито к кресту, стали фигурировать в христианском мире после 324 года, когда мать императора Константина Великого (272-337), Елена (250-330), провела раскопки в Иерусалиме и нашла там Крест Господень и несколько гвоздей. О подлинности этих реликвий спорить не будем. Крест остался в Иерусалиме, а гвозди Елена привезла в Константинополь. Происхождение железной короны Ломбардии до сих пор точно не установлено. Историки и другие исследователи размещают время её создания от середины IV века до второй половины VIII века. Сторонники раннего создания короны исходят из того, что она очень сильно напоминает византийские вотивные диадемы и предполагают, что она была создана во времена Константина Великого, и тогда же для скрепления её пластин был использован священный гвоздь. Если предположить справедливость этой гипотезы, то первоначально “железная корона” использовалась для религиозных целей в одном из главных соборов Константинополя. Кстати, почти все историки согласны с тем, что первоначально корона состояла из восьми фрагментов, но, предположительно в конце XIII века, два сегмента были утрачены. Каким же образом эта корона оказалась в руках лангобардов? Ведь наиболее популярная легенда (именно легенда, так как никаких документов или письменных свидетельств не сохранилось) относит создание этой короны ко временам уже упоминавшейся выше королевы Теоделинды (570-628). Теоделинда была дочерью баварского герцога Гарибальда I (500-590), основателя династии Агилульфингов, и в 589 году была выдана замуж за лангобардского короля Аутари (540-590). Романтичная легенда говорит, что Аутари заочно влюбился в Теоделинду и решил лично проверить, так ли она красива, как гласит слава о ней. Лангобарды тогда воевали с баварцами, но Аутари инкогнито добрался до дворца баварского герцога и смог убедиться в красоте его дочери. Кстати, Теоделинда была католичкой, а Аутари, как и все лангобарды, придерживался арианского вероисповедания, то есть с точки зрения официального Рима он был язычником (или еретиком). В 590 году Аутари умер при невыясненных обстоятельствах (многие считают, что он был отравлен), и Теоделинда в том же году по настоянию лангобардской знати выбрала себе нового мужа. Им стал Агилульф (?-616), двоюродный брат Аутари. Агилульф был коронован уже в 591 году, но он тоже был арианином и не препятствовал своей жене придерживаться никейского символа веры, то есть оставаться католичкой. Вот тут-то, якобы, и появилась на свет эта железная корона Ломбардии. По легенде, новый папа Григорий I Великий (540-604, папа с 590) прислал Теоделинде в подарок тот самый гвоздь, а королева для коронации Агилульфа велела изготовить корону, для скрепления сегментов которой и был использован этот священный гвоздь. Last Edit: 30 Окт 2014 02:21 by Vladimirovich. Рулоф ван ден Брук из Утрехтского университета (Нидерланды) опубликовал книгу «Псевдо-Кирилл Иерусалимский о жизни и страстях Христа», в которой впервые предложил перевод Коптского Евангелия, написанного почти 1 200 лет назад. Этот апокриф уникален: в нём встречаются такие сюжетные повороты, с которыми исследователи нигде больше не сталкивались. Например, Понтий Пилат трапезничает с Иисусом перед распятием за одним столом и предлагает принести в жертву своего сына, дабы спасти Христа. А Иуда поцеловал Иисуса в связи с тем, что тот обладал способностью изменять внешний вид и отряд «воинов и служителей от первосвященников и фарисеев» не мог его узнать. Кроме того, арест, судя по этому тексту, произошёл во вторник вечером, а вовсе не в четверг, как сообщают канонические писания. Документ существует в двух списках, хранящихся в Библиотеке и музее Моргана (Нью-Йорк) и в музее Пенсильванского университета. Для перевода использована в основном нью-йоркская рукопись, потому что другой вариант — практически нечитаемый. Коптская и эфиопская церкви считают Пилата святым, что объясняет сочувственное отношение к нему со стороны автора текста. «Без дальнейших церемоний Пилат накрыл на стол и ел с Иисусом на пятый день недели. И Иисус благословил Пилата и весь дом его». Далее Пилат говорит Иисусу: «Вот, ночь пришла, встань и удались, и когда наступит утро и они обвинят меня за Тебя, я отдам им своего единственного сына, дабы они убили его вместо Тебя». Но Иисус утешает его: «О Пилат, ты удостоился великой благодати, ибо хорошо принял Меня». Иисус также дал понять Пилату, что мог бы скрыться в любой момент, если бы пожелал: «Пилат взглянул на Иисуса, и, вот, Он стал бестелесным; и он не видел Его долгое время». В ту же ночь Пилат и его жена видят один и тот же сон, в котором происходит убийство орла, то есть Иисуса. Что касается Иуды, то в канонических текстах он предаёт Иисуса в обмен на деньги с помощью поцелуя, которым помогает опознать Спасителя. Этот апокриф объясняет сей поступок следующим образом: «Иудеи сказали Иуде: Как же нам арестовать Его, если Он не имеет одного вида и изменяется. Порой Он румян, порой бел, порой рыжий, порой цвета пшеницы, порой бледен, словно аскет, порой является юным, порой стариком». Не в силах дать описание внешнего вида Иисуса, Иуда предлагает его поцеловать. Г-н ван ден Брук поясняет, что впервые подобное объяснение поступку Иуды предложил раннехристианский автор Ориген в труде «Против Цельса»: «Каждый видел Его по-своему». Больше всего исследователя поразил перенос апостольской вечери и ареста Иисуса на вторник. И выходит, что действительно последнюю вечерю Иисус разделил не с учениками, а с Пилатом — уже после того, как предстал перед Каиафой и Иродом. Last Edit: 07 Апр 2019 07:19 by Vladimirovich. А сами апостолы правильно определяли?